the small gray robot is sitting in a bathtub. The robot faces south. The bathtub faces North.The bathtub is on water. There is a TV on top of the robot. 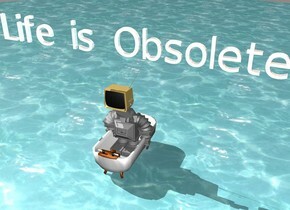 The shiny white "Life is Obsolete" is above the TV.